The Lifegard Aquatics Pro-MAX 3" Body 25W Standard High Output UV Sterilizer features a patent-pending, flow-through design with less restrictive than usual angled inlet and outlet ports requiring less plumbing. This unique design enables easy installation of new or replacement systems as it can be positioned in multiple ways to fit tight spaces. 1,000 GPH max flow rate. Requires a pump with a flow rate less than 1,000 GPH. Recommended 550 GPH algae & bacteria flow rate. For aquariums up to 130 gallons. For ponds up to 2,400 gallons. Connections: 2" slip inlet & outlet union fittings. The angled fittings can easily be turned so that the connecting pipes can meet the UV at a variety of angles. This is a Standard unit and it does NOT come with an advanced ballast that counts down days of use. Only the Amalgam units have the advanced ballast. These UVs do not come with a manual. Before setting up we recommend you watch the YouTube Pro-MAX Setup Video. The Lifegard Aquatics Pro-MAX 3" Body 40W Standard High Output UV Sterilizer features a patent-pending, flow-through design with less restrictive than usual angled inlet and outlet ports requiring less plumbing. This unique design enables easy installation of new or replacement systems as it can be positioned in multiple ways to fit tight spaces. 2,500 GPH max flow rate. 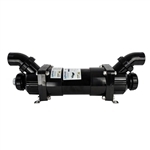 Requires a pump with a flow rate less than 2,500 GPH. Recommended 1,200 GPH algae & bacteria flow rate. For aquariums up to 250 gallons. For ponds up to 4,700 gallons. The Lifegard Aquatics Pro-MAX 3" Body 90W Amalgam High Output UV Sterilizer features a patent-pending, flow-through design with less restrictive than usual angled inlet and outlet ports requiring less plumbing. This unique design enables easy installation of new or replacement systems as it can be positioned in multiple ways to fit tight spaces. 4,600 GPH max flow rate. Requires a pump with a flow rate less than 4,600 GPH. Recommended 2,800 GPH algae & bacteria flow rate. For aquariums up to 650 gallons. For ponds up to 11,000 gallons. This am Amalgam unit with a ballast that counts down the number of days until you need to replace the bulb. The green light on the ballast will be lit up when everything is working properly. The red light will come on and the ballast will beep when the UV is not working properly (e.g. bulb failure, leak into the quartz sleeve, short circuit). The Lifegard Aquatics Pro-MAX 3" Body 120W Amalgam High Output UV Sterilizer features a patent-pending, flow-through design with less restrictive than usual angled inlet and outlet ports requiring less plumbing. This unique design enables easy installation of new or replacement systems as it can be positioned in multiple ways to fit tight spaces. 6,000 GPH max flow rate. Requires a pump with a flow rate less than 6,000 GPH. 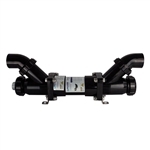 Recommended 4,000 GPH algae & bacteria flow rate. For aquariums up to 900 gallons. For ponds up to 14,500 gallons. The Lifegard Aquatics Pro-MAX 5" Body 55W Amalgam High Output UV Sterilizer features a patent-pending, flow-through design with less restrictive than usual angled inlet and outlet ports requiring less plumbing. This unique design enables easy installation of new or replacement systems as it can be positioned in multiple ways to fit tight spaces. 4,000 GPH max flow rate. Requires a pump with a flow rate less than 4,000 GPH. Recommended 2,100 GPH algae & bacteria flow rate. For aquariums up to 350 gallons. For ponds up to 6,000 gallons. The Lifegard Aquatics Pro-MAX 5" Body 90W Amalgam High Output UV Sterilizer features a patent-pending, flow-through design with less restrictive than usual angled inlet and outlet ports requiring less plumbing. This unique design enables easy installation of new or replacement systems as it can be positioned in multiple ways to fit tight spaces. 5,500 GPH max flow rate. Requires a pump with a flow rate less than 5,500 GPH. Recommended 2,800 GPH algae & bacteria flow rate. The Lifegard Aquatics Pro-MAX 5" Body 120W Amalgam High Output UV Sterilizer features a patent-pending, flow-through design with less restrictive than usual angled inlet and outlet ports requiring less plumbing. This unique design enables easy installation of new or replacement systems as it can be positioned in multiple ways to fit tight spaces. 7,000 GPH max flow rate. Requires a pump with a flow rate less than 7,000 GPH. 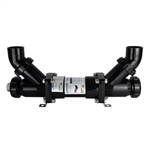 Recommended 4,000 GPH algae & bacteria flow rate.